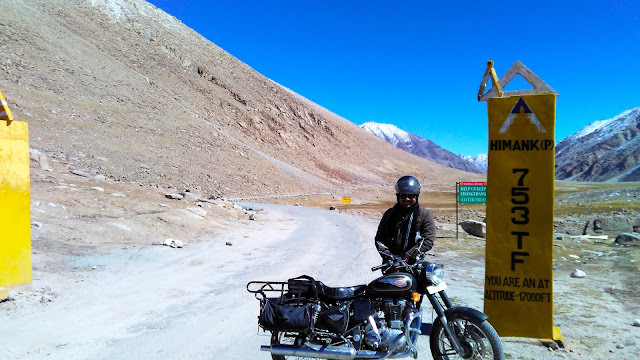 NITSA: Leh Ladakh by Road –It’s the Memory that Never Leaves You !! My journeyfrom Srinagar to Kargil. Ladakh road trip is mostly famous among bike lovers all over the Asia. Usually this bike trip starts from Delhi. We begin our road trip in Scorpio ( 7- Seater Vehicle) as we were large number of people in a group. We chose the Srinagar Leh highway to begin our journey with. There is one Manali Leh highway too which is also short if compared to Srinagar Leh highway, but the faster you climb to higher altitude then more likely you will be prone to AMS (Acute Mountain Sickness). To get rid of such situation, we chose Srinagar Leh highway. Also, the Srinagar Leh highway has got better connectivity. All this doesn’t mean that I am against Manali Highway. I do want to witness the beauty lying there, so I opted to return via Manali Highway. After we left from Kargil, now is the time to encounter lots of passes on our way. Srinagar leh highway is blessed with plethora of such passes. These passes are located at distinguishable heights. Getting yourself clicked on such Pass is victory in itself. Namikala Pass was the first Pass located at height of 12198 ft which was achieved by us after we left for Leh from Kargil. It is undoubtedly blessed with lots of natural and scenic beauty. It is one of two highest passes between Kargil and Leh. Mulbek Valley is the best place to go to visit nearby this area. Fotula Top at the height of 13479 ft and is the highest among all passes on Srinagar Leh Road. The smile at our faces proves the sense of victory within us. We could not hide the joy we were feeling. The brown rugged mountains were so beautifully carved by nature that I could not let myself leave the place. There was no greenery, no blue river flowing with a beautiful sound but still the cool wind blowing through our faces among st the rocky and deserted mountain was just magnificent. Sunset viewing at such location is a boon in itself and we are blessed indeed. 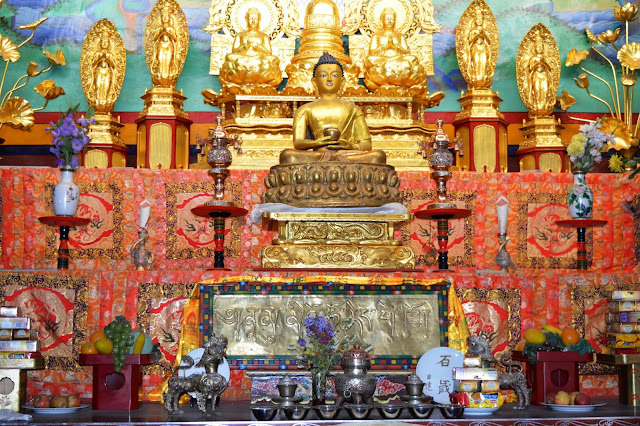 Later in the evening we reached Leh which is a small town in the Leh ladakh region. We as planned looked for some decent guest house to stay in, where we got a nice big house for two nights. Everything was perfect there except one dog that used to continually bark at us anytime we moved in or out. So we were kind of afraid of him. But yes he did not harm us in any way. Nice creature. It was a house but all the provisions of a decent hotel were provided there. Well maintained rooms with attached bathrooms and the necessary items. Well established kitchen for the visitor and for the people living in there. The staff was also quite professional in their work. 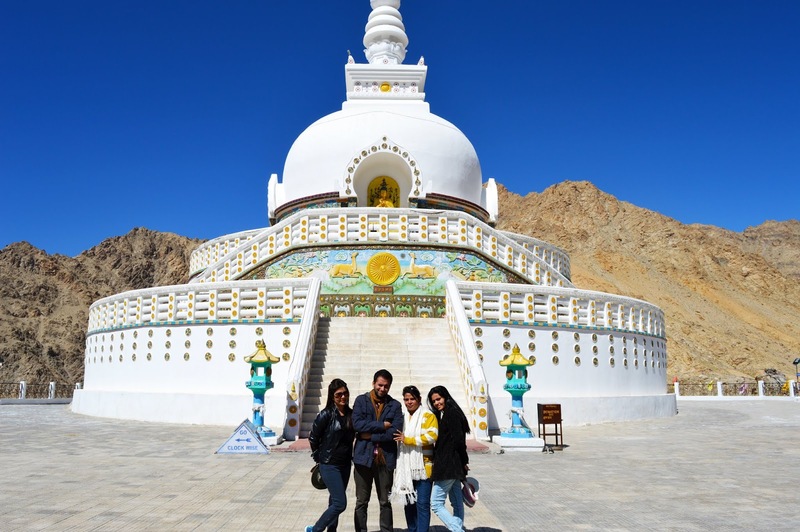 Shanti Stupa is a Buddhist white dome and the first place we planned to visit after we reached Leh. It is located on Chanspa hilltop and provides the magnificent view of the city and surrounding landscape especially during full moon. Sunrise and sunset time are the best hours to visit such place offering best of the views of the landscape and nature. 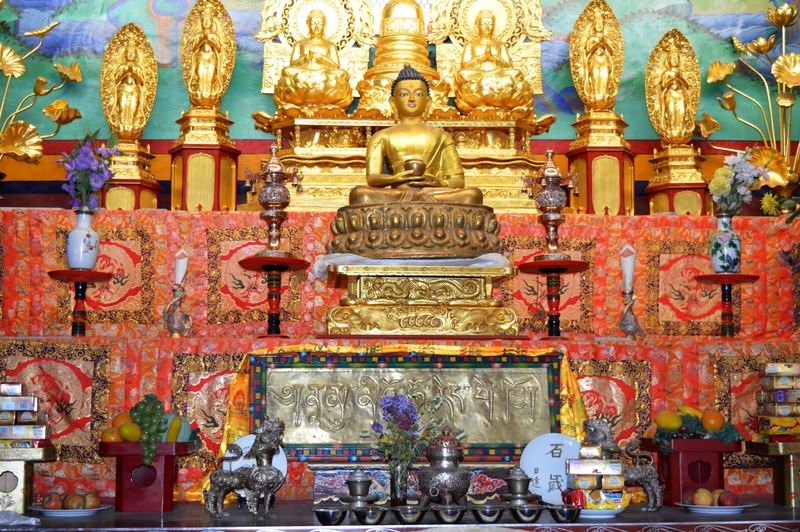 Leh region is equipped with lots of monasteries but Shanti Stupa is the best and the closest to Leh. We could not stop ourselves from indulging into photography at such a calm and beautiful place. We had to climb a lot here. Luckily we were all ready with water bottles with us that helped us keep hydrated. We were taking breaks in between though, so that we could gather energy to climb further. 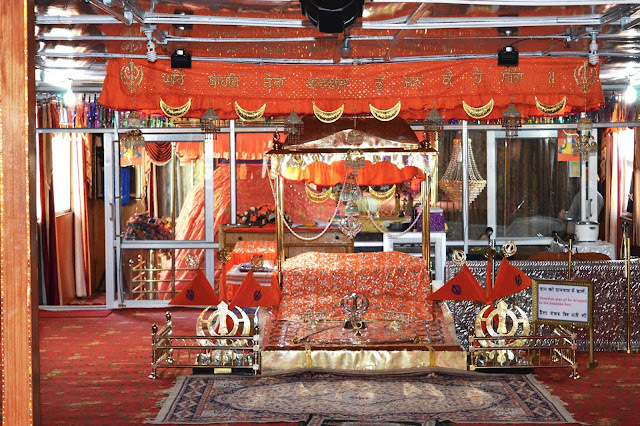 Gurudwara Pathar Sahib is another religious place in Leh relating to Sikh religion. In spite of being at such a secluded location, there were lots of people to visit it. 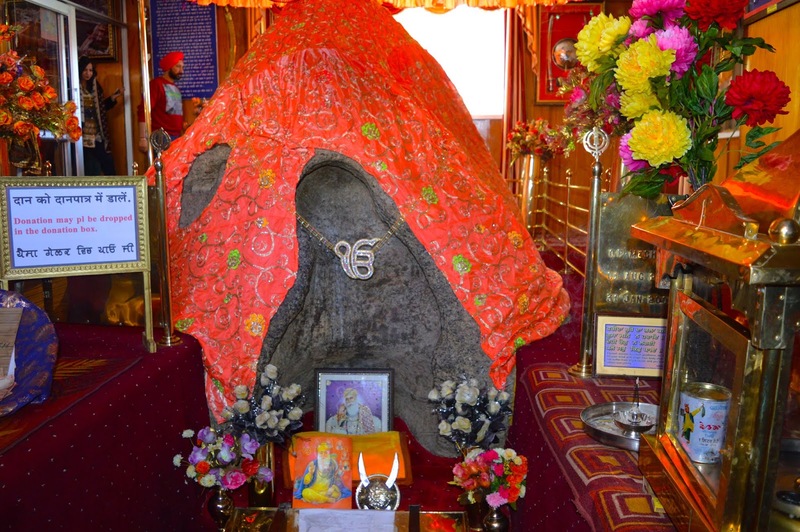 Just after Shanti Stupa we made our ways to Gurudwara Pathar Sahib. It is one of the finest places to calm your soul. One would for sure love the ambience it has got. I was totally into it. It was so peaceful and calm. 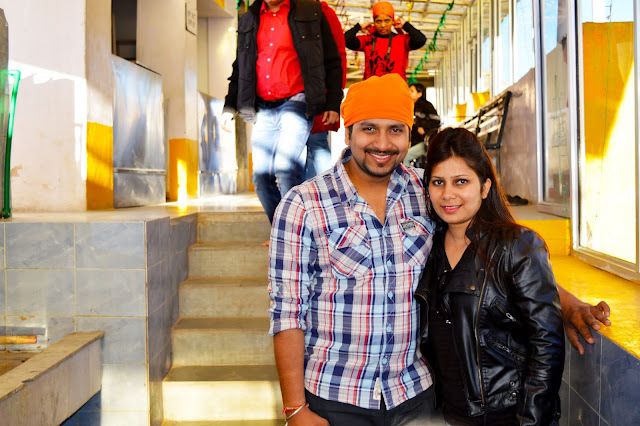 After done with our visit to Gurudwara we headed straight towards Magnetic Hill. 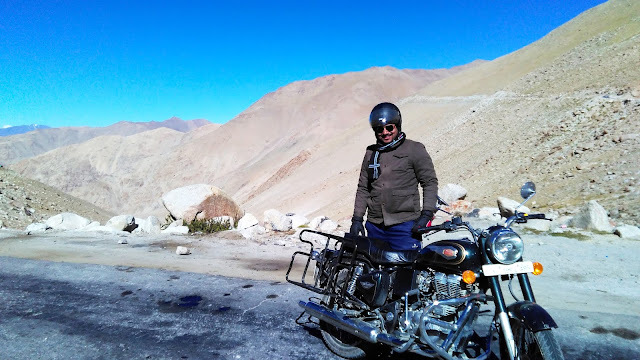 Magnetic Hill is another well known tourist spot in Leh Ladakh region. It is located at Leh – Kargil –Baltik national highway which is about 30 kms from Leh. It is a gravity hill known to have some magnetic powers that can pull the car uphill, even the passing aircrafts need to manage their speed to get rid of jerks caused by magnetic rays. 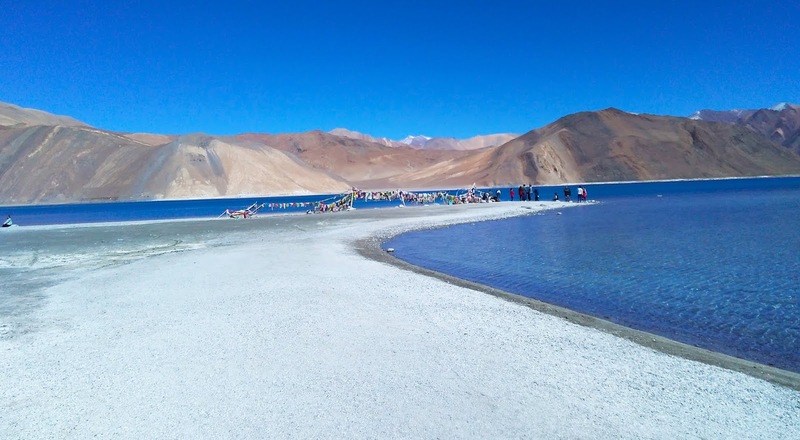 The trip to Pangong Lake is the most memorable one on our entire Leh Ladakh Road trip and this is entirely not because Pangong Lake is one of the top destinations to visit. This is all because of the memories created by us all, some good and some worth laughing. 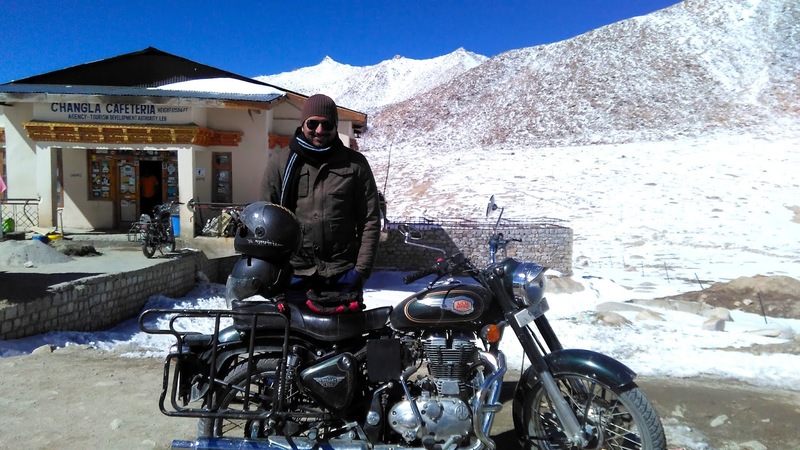 One day before our travel to Pangong Lake, Nitin was so damn excited to get himself hire a bullet. We were also crazy about it and the road which we were about to experience was immensely and thoroughly revolving in our heads. We anyhow had to do lot of market research for the purpose. Most of our time was invested here. Few of the vendors were not ready to let us the bike for the entire one day. They were enforcing us to stay in the camps of Pangong Lake for one night. Their aim was to rent bike for two days and earn more. So my advice is not to get trapped in their words, because they will try their level best by saying that it is not possible to return back from there in one day. So here is the truth – it is very much possible to travel to Pangong Lake via Bike with return. Thus we ended our Search until we succeed. We got the bike with not many formalities. Since we were a large group of people including the young ones and the oldies, we just got one bike. For the rest we arranged an SUV. 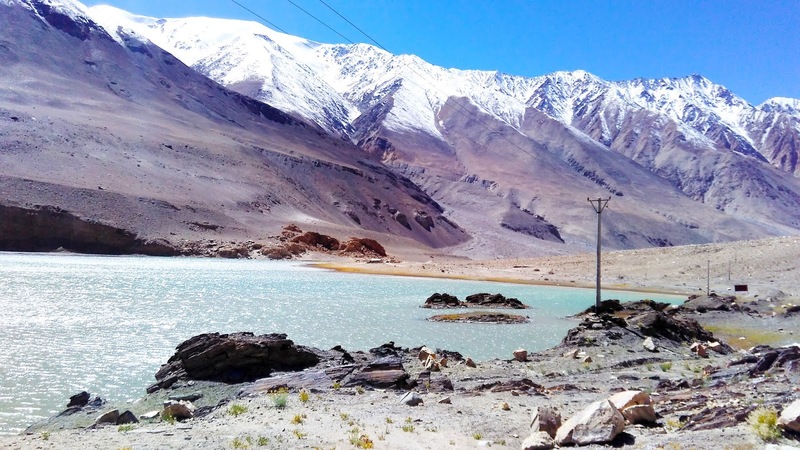 Please note that it is not allowed to take your own vehicle to Pangong Lake, you need to hire a local one. We started our journey early morning as planned. Nitin and our younger brother started journey on bike and rest of us all got seated in SUV. It was all fun until we detected that our camera has died (may be we forgot to charge it) and there is no outlet on the way to get its battery. That was an Aw moment for all of us, but with no delays we checked our phones. We were somewhat relaxed within our hearts as our phones were all working. 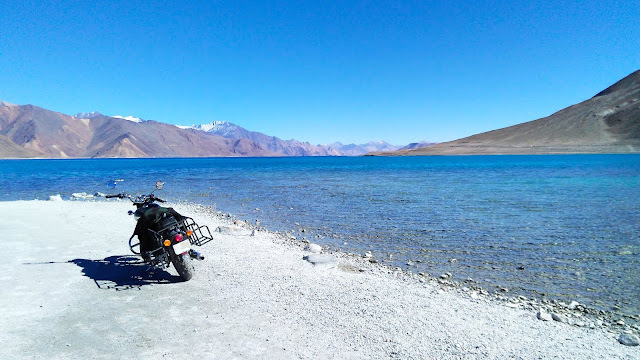 We followed the route from Leh to Pangong Lake. This is the most general route followed by visitors as it provides the best of the roads. 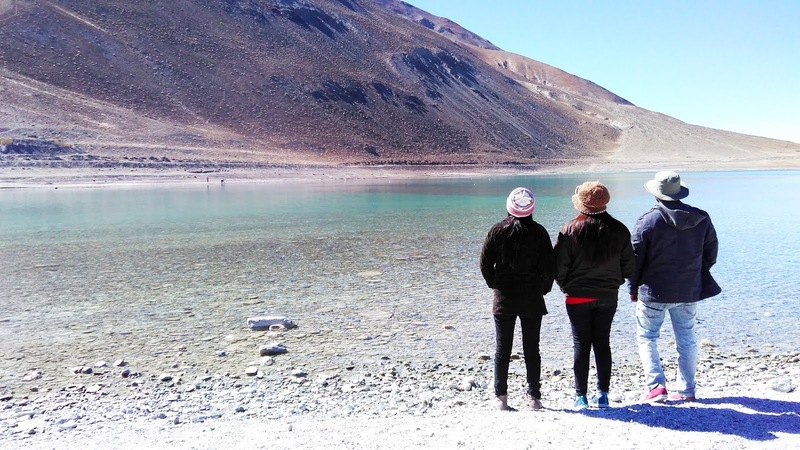 Chang La is one of the desired places of attraction en route Pangong Lake. It is world’s second highest Pass after Khardung La. Reaching Chang La is yet another victory in itself. It was chilled at its best and we took a small halt at the place to admire the beauty. Do not miss one hot cup of tea at ChangLa Cafeteria. It took us around 5 to 6 hours to reach Pangong Lake and Oh My God, it is undoubtedly the most beautiful place. God knows why it is Lake? It is So So So big. Wow. Lake is so clean and the blueness all around made me fall in love with color blue. Blue lake, rocky brown mountains and green blemishes due to reflection, everything was so colorful. I would recommend staying for a night to experience the camp stay, camp fire and barbecue over here. Though I did not, but yes, after visiting such place I do want to plan one another trip to stay here for a night. The temperature down to 0 degree Celsius may bother you for some time but the view at night is going to make you fall in love with it. We got ourselves click lots of pictures with our respective phones. There were few food options too. After spending quality time at such a lovely place with our loved ones we were ready to move back to our hotel. We made sure to leave early to reach on time. We also had to return our rental bike without any delays and damage. Everything was done smoothly. Later on the next day, we made ourselves ready to move forward towards Sarchu. That was the process of returning back to our native place Delhi. Quality of Non Erasable Memories depends upon individual way of living. The tour like https://www.shimlapacks.in/shimla-honeymoon-tour-packages-pune will help you to explore yourself. This will make you aware about your own capabilities and powers. This will also make you aware about your weak points. This will make you feel confident and also help you in your self development.